Home » News » Local News » Nevada City, Colfax, Kings Beach, Pollock Pines, This Could Be You! 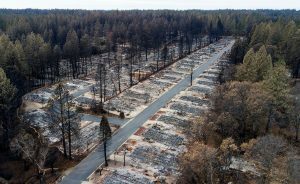 The McClatchy Newspaper group has released a report that lists 75 towns and cities in California with populations of over 1000 residents that are in severe danger of destruction to wildfire damage, similar to the city of Paradise. They listed ten they believe are in severe danger. Nevada City, Colfax, Kings Beach, Pollock Pines, Arnold, all from this immediate area were listed in the report. Overall the report says that 350 thousand California residents live in towns and cities inside a very high fire severity zone.